$10, $20 or $50 is enough to support our competition teams with your name on the side of our car riding with us to success. 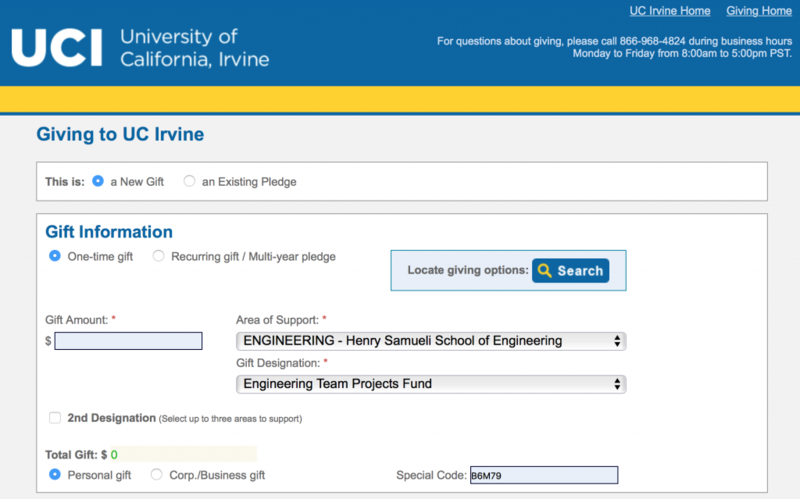 This link UCI Racecar Engineering will take you to the UCI Foundation donation page shown here. Please help us out. The Anteater Racing team now has a crowd funding site where you can donate directly to the team and help push our project forward! The team has four vehicles this year (the most it ever has), therefore your support is critical. We are getting bigger, we are getting better, and we need your help! If you or your company are interested in sponsoring us, please contact Vazgen Frnzyan (vfrnzyan@uci.edu).